Update: Giveaway now closed! Congrats to Andrea on winning the book (sorry, Mom, maybe next time!). Thanks to everyone for entering and leaving your favorite dishes – I have so many great Japanese recipes to try now – sounds like katsu curry and okonimyaki are must tries. I don’t cook a lot of Asian food. Sure, your occasional super-Americanized stir-fried rice, or a little chicken cooked in soy sauce, but rarely anything traditional. It’s out of my comfort zone. I have a lot of friends who are enamored with various Asian cultures, or who are part of an Asian culture and still very much tied to their family’s traditions and roots, but I’ve always been more drawn to Western food cultures – Italian, French, Irish, Polish, Czech. It’s more accessible to me – closer to home. This is precisely why Nancy Hachisu’s beautiful new cookbook “Japanese Farm Food” was such a wonderfully eye-opening book for me. Just the introduction is full of new information – the best type of miso to buy for everyday use, how to grind tofu, and what, exactly, a suribashi is (it’s basically a grooved mortar and pestle for grinding seeds and nuts, if you’re wondering). In fact, there were so many new words and ingredients and techniques in the opening chapter that I was almost a little intimidated. I shouldn’t have worried – simplicity turned out not to be a problem. Many of the recipes are simple, some shockingly so – like “edamame and sea salt,” or “raw egg on hot rice,” both of which are exactly what they sound like. This level of simplicity is typically not my cup of tea in cookbooks – as someone who spends a lot of time cooking and thinking about cooking, I don’t need a book to instruct me in truly simple preparations. However, in this book it seems appropriate. Japanese food is simple by nature, and it is in preparing the simplest meals that technique truly counts. There are also plenty of recipes a bit more complicated, like Chicken and Miso Meatballs or Egg Custard Squares with Crab and Spinach. Some ingredients, such as yuzu, miso, and fresh wasabi, may be hard to find, but once you’ve sourced them, they’re used over and over again. For anyone who grows their own vegetables or frequently finds themselves with an abundance of produce, you will find many new ways to prepare them in this book – a major plus. Between Fried Eggplant Halves with Sweet Miso, Smashed Cucumber Pickles with Garlic, and Zucchini Coins with Roasted Sesame, I’ve taken plenty of notes on what to do with next year’s end-of-summer produce. I should also note that the recipes in this book are intrinsically healthy, as much of traditional Japanese cuisine is. Very few recipes call for dairy or wheat, the majority are vegetable based, and the techniques are such that the ingredients maintain most of their nutritious qualities. If you’re looking to change your diet and lifestyle (and you like Japanese food, of course), this book may be a great source of inspiration. But this book is not just about the food. A big part of its charm are the short vignettes, little glimpses into Nancy and Tadaaki’s life in their Japanese farmhouse. At first it seemed strange to me that the stories were somewhat disconnected, and not a continuous tale of Nancy’s integration into Japanese life, but I think they ended up being my favorite part. The wannabe farmer buried inside me loved imagining the first taste of a fresh pecan grown from seed 20 years earlier, or of midsummer edamame just pulled from the bush, served hot and salty with a cold beer, the way Americans might enjoy corn on the cob. I think any armchair traveler with the slightest interest in Japan will revel in this book. This is a book that was very clearly assembled with a lot of thought and love. It is not haphazardly thrown together, nor is it repeating material and recipes that those of us who consume food literature at a rapid pace have seen a hundred times. But before I can truly condone any cookbook, I have to test out a few recipes to see if they’re worthwhile. In this case, I started with the homemade ramen. 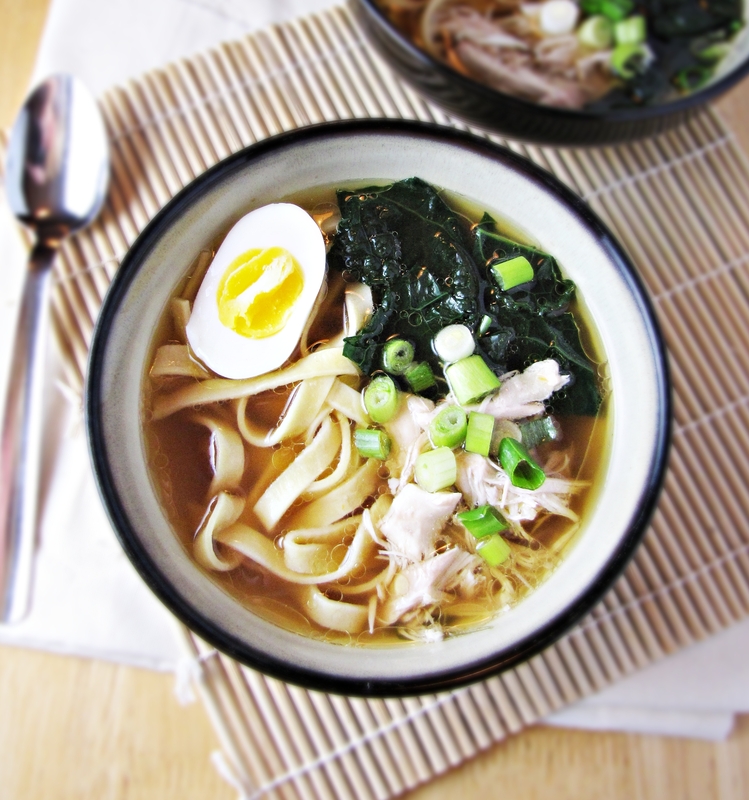 Ramen is a food so steeped in mystique and tradition, I was curious to see how it would turn out at home. The answer? Worth every minute of the 3-hour preparation. 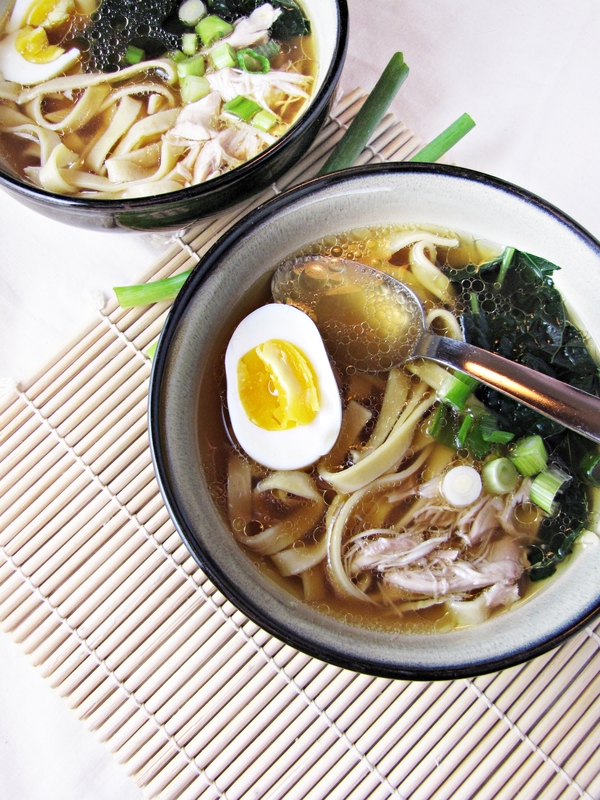 The long-simmered chicken broth is clear and nourishing, the home rolled noodles puffy and tender, the half-boiled egg creamy and full of the broth’s flavor. It is exactly what I want to be slurping on any cold and dreary afternoon. It definitely takes some planning ahead, and the noodles were a little bit tricky to work with, but I would absolutely make it again on a lazy Saturday. I still have a few more recipes to test, but so far, this book passes the recipe test. The bottom line: Japanese Farm Food is a ground-up introduction to traditional Japanese food, packed with simple, technique-focused recipes. Nancy’s voice is strong and her stories intimate – resulting in a beautiful book that is clearly a labor of love. I’d strongly recommend it to anyone looking to expand their repertoire of healthful (or vegetarian) recipes, learn new methods for cooking fresh produce, or to anyone with any interest in the culture and food of Japan. Giveaway: Thanks to the folks over at Andrews McMeel Publishing, I’m giving away one copy of Japanese Farm Food. To enter, leave a comment below, answering the question: What is your favorite Japanese (or generally Asian, if you’ve never had Japanese food) dish? Have you ever made Japanese food at home? (P.s. I loved hearing your answers about your favorite winter dish – seems a lot of you love beef stew and chicken pot pie!) For one additional entry, you can subscribe to Katie at the Kitchen Door via email or RSS, and leave a separate comment letting me know you have (you can also do this if you’re already a subscriber). One winner will be picked at random at midnight on Friday, November 2nd. Be sure to include your email in the comment form so I can get in touch with you! If the winner doesn’t respond to me within 48 hours, they forfeit their winnings and I will pick a second winner. US only, apologies to my international readers! Giveaway now closed! Disclaimer: I was sent a free review copy of Japanese Farm Food by the publisher, Andrews McMeel, but all thoughts and opinions shared here are honest and my own. Recipe from Japanese Farm Food, by Nancy Hachisu. Serves 4. Make the broth. Preheat the oven to 450°F. 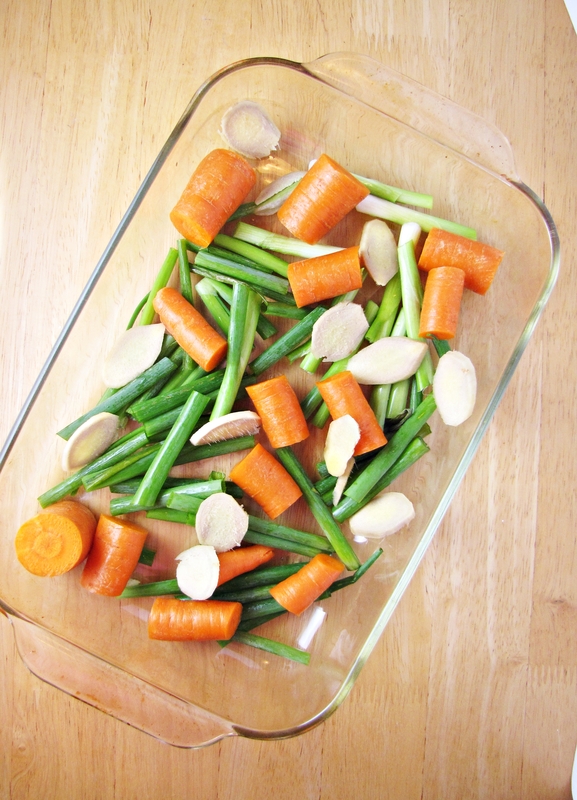 Place carrots, leeks/scallions, ginger, and chicken thighs in a roasting pan, and toss with salt and oil. Roast for 40 minutes. Pour chicken, veggies, and all the juices into a large stockpot, and cover with 16 cups of cold water. Bring to a boil, then lower heat and simmer, covered, for 1 hour. After 1 hour, remove the lid. Take out 2 of the chicken thighs and place in a small bowl. Cover the thighs with hot broth and let cool to room temperature, then shred. Continue simmering the remaining broth for another 30-60 minutes, until it is reduced to about 8 cups. Strain broth into a clean pot and keep warm over low heat. Discard vegetables and remaining chicken thighs. Make the noodles: mix 2 TBS of the sesame oil into the flour with your fingers until it is crumbly. Add eggs and egg yolks and stir with your hand until incorporated, then knead on a flat, clean surface for 5 minutes until the dough is pliable but stiff. The dough takes some force to really work it into a pliable piece. Let dough rest 10 minutes. Roll out the noodle dough to a thickness of about 1/8 inch using a pasta machine or a heavy rolling pin. Cut into noodles by hand or using pasta machine. Nancy recommends skinny linguine-shaped noodles, but we made thick ones because the dough wasn’t workable enough to make the smaller noodles – the thick ones worked great for us! Prepare the toppings: bring a large pot of water to a boil over high-heat. Add the eggs and boil for exactly 7 minutes, then remove with a strainer and place directly into a bowl of ice-cold water. Let cool, then peel. In the boiling water, blanch the bitter greens until just tender, then add to the cold water with the eggs. Keep the water boiling – you will use it to cook your noodles just before serving. 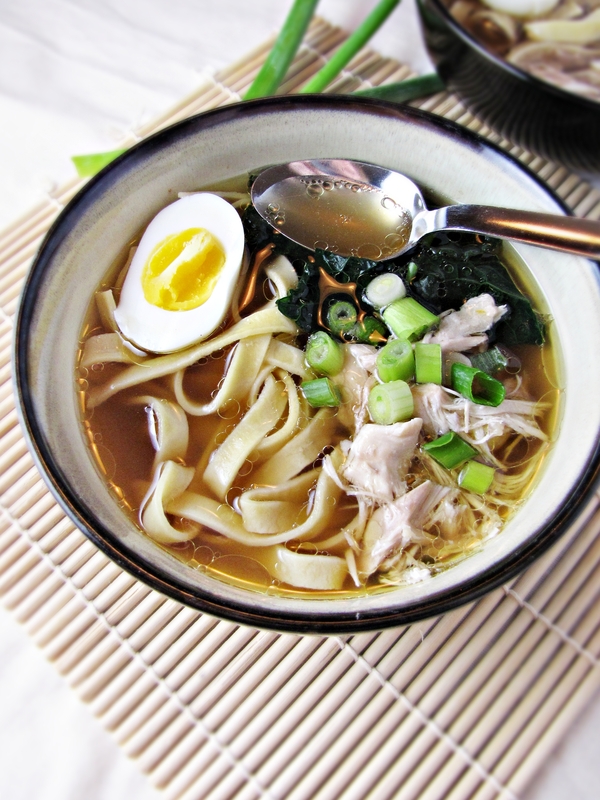 Once the broth, noodles, and toppings are ready, prepare the bowls: add a small amount of miso, soy sauce, or salt to each bowl (according to diner’s preference) and pour a ladelful of hot broth over the seasoning. Stir the broth into the seasoning. Divide the shredded chicken amongst the bowls. Drop the noodles into the boiling water and cook for 2 minutes – they will float up to the top when they are done. Remove the noodles with a strainer and divide among the bowls. Top off each bowl with a few more ladlefuls of hot broth, 1 egg cut into halves, a handful of the cooked grens, some of the nori pieces, and a sprinkling of scallions. Serve very hot, with extra seasoning as desired. I feel as though you wrote this post just for me. I have toying with the idea of starting to review cookbooks on my website and I live the love the way you wrote this one. Honest and soulful. Secondly, I recently put this book on my list of books to buy. I saw it at the book store and was instantly capture by its energy. On that note one of my favourite Japanese dishes that I can’t find anywhere in montreal since I discovered it in Ann Arbor years ago is oyako donburi. A rice bowl with chicken sweet onions and egg. Not something I eat much anymore but would devour In second if I had the chance. Kieran, thank you for such a thoughtful comment. I love reading cookbooks, and my friends are tired of hearing about them, so I’m glad I’ve reached the right audience here! If you start reviewing, I’ll be sure to check it out – I’m always looking for good book recommendations. Also, oyako donburi sounds super delicious… I don’t think it’s in this book, but I may have to seek it out! Thanks for responding Katie. Nice to see you are reading the comments. I know how you feel about having friends who are tired about hearing cookbooks and other food things. Although they all love the food. Nice to hear from someone who is as passionate about it as I am. Would love for you to check out my site. I love connection with like minded people with positive energy. Also, love reading your blog on my Google Reader! My favorite thing from my trip to Japan earlier this year was okonomiyaki, which is a savory thick pancake with a variety of ingredients. I think it literally translates to something like “as you like it,” so they are personalized to your taste. I haven’t had the courage to try to make one myself yet, but I haven’t thought about it in a while, maybe this is just the reminder I need to try it out! Enjoying getting to know you! This is a beautiful inspiration to try Japanese cooking. I always dine out for Japanese food. I will try this very soon. Looks like a great cookbook and even better soup! Look forward to trying! I love Japanese food! I grew up in Seattle and we ate a lot of Japanese food in my family even though we are not ethnically Japanese. Hard to pick a favorite, but right now I’m craving okonomiyaki – it’s a savory omelet-pancake with the veggies and meats of your choice, topped with a really tasty sauce. And I read all your posts through my Google Reader! P.S. That book cover is gorgeous. I’ve made sushi at home before, that was a labor intensive process. But my favorite is actually oden! What drew you to this book is exactly what makes it interesting to me–I rarely cook Asian food, Japanese or otherwise, and I loved the idea of a book that touched on the fundamentals–this book has therefore been on my request list at the library. I have definitely never tried Japanese cooking at home, and the only thing I can say that I’ve really tried is sushi–in a restaurant. Xing fingers and thanks for the giveaway! Okay even though I’m your mom, I want to enter to WIN! This recipe looks yummy, my favorite Asian dish is bibimbop. We made sushi years ago but it’s much easier just to get it at the supermarket now. I make rice in my rice cooker, does that count? Oh and lots of recipes from Ming Tsai! Okay this looks amazingly delicious, and I LOVE the review. I haven’t cooked a lot of Japanese dishes, but eat a lot of edamame with ginger and soy which might count! Hope I win this book, if I don’t I might just have to buy it. Being with an organic farmer means you have to come up with a lot of creative ways to use up your vegetables. Any recipes in there that use root veggies like beets or parsnip?! PS I subscribe to you via email!! Edamame totally counts as Japanese food! I grew some this summer and it was super delish. As far as root veggies, there’s recipes for daikon, carrot, potato… but not a lot of other root veggies. The major vegetables represented are eggplant, cucumber, various greens, squash, and carrots! Well we have plenty of carrots, cucumbers, greens and eggplants (squash were demolished by bugs!). Thanks for the insight, even more intrigued by this book now. I love sushi and I have tried making it at home but it’s never as good as the sushi in restaurants. I made ramen, sushi, and a few other dishes. Love the looks of this cookbook! Loved your recipe and the Cookbook!!! My favorite is Saikyo-zuke (sweet miso-marinated fish), easy and tasty. My favorite Japanese dish is simple braised kabocha squash. Sweet and salty. A terrific side dish. Japanese Farm food is on my Amazon wish list. Fingers crossed! My favorite is sushi! I very much enjoy the nuanced flavors and textures. My favorite cookbooks are those that include a story or a bit of history. Japanese Farm Food would be a marvelous book to add to my bookshelf! I absolutely love Japanese curries. Katsu curry over rice is the BESt comfort dish! Kushikatsu which is fried meat, vegetable, or seafood on a stick. I really really love pork belly katsu. Yum-o! Black Sesame Ice Cream (Kuro Goma). Great for Halloween too. This looks like an excellent cookbook. Added it to my WL and TBR. Thanks for letting us know about it. Agadashi tofu. Have not tried to make it at home. I love a really rich ramen, that’s been difficult for me to find lately. Definitely sushi… never made it myself though. after much thought, my favorite is tuna mayo onigiri. I’ve never made it at home; I don’t know why. I should do something about that. That soup looks so good! I like making onigiri at home, and Japanese pickles, but my real love is the ridiculous sushi rolls at our favorite local place. :) There’s also an excellent Japanese ramen shop with the best fatty pork belly. Thanks for the giveaway opportunity! I like to eat Japanese food. I made some sushi at home. I will try to make ramen that look delicious. Thank you for sharing you excellent blog and nice giveaway. Mochi with red bean filling is my favorite desert and I also love to try to make homemade ramen, thanks for the recipe. When I eat out, I love grabbing sushi! But for cooking at home, I like to make yakisoba or udon noodle soup. I’m a Google Reader RSS subscriber! I love hayashi rice! I can never get enough! I love sushi! 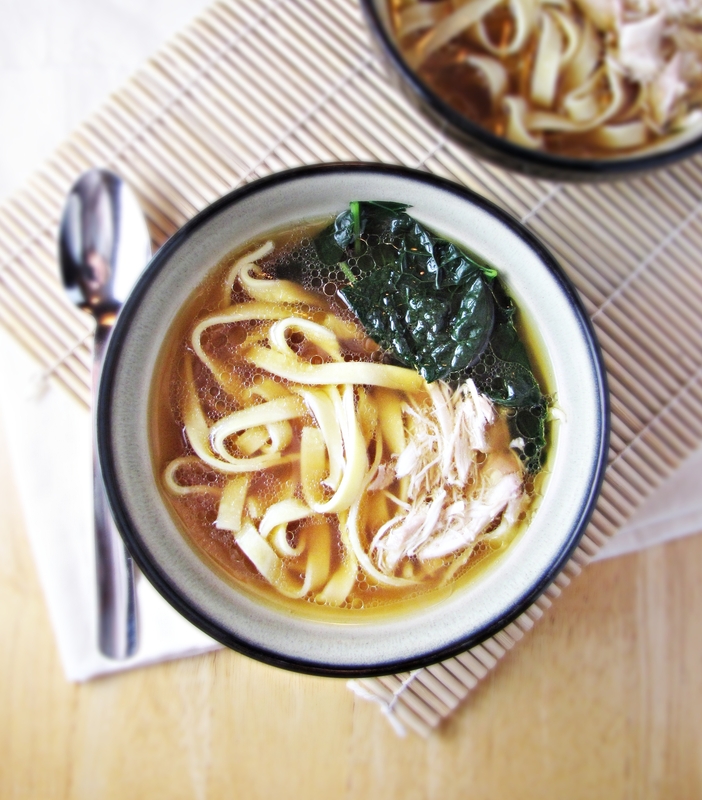 I have been wanting to try a ramen soup and now I have a recipe to use. Katie, the blog is lovely, keep up the great work. As far as Japanese food goes, my favorite and so, so simple is Miso Soup. The earthy palate of this soup is so comforting. The miso broth, tofu and scallion base lends it self to so many variations. Miso soup lends itself to so seasonal variations; it is great if you have a garden, belong to a gardening co-op, have access to a local Farmers Market or are part of a local garden swap. You can adjust the seasonings and ingredients to help balance all sorts of issues of imbalance in your body. It is great snack or mid afternoon “pick me up”, after school/before dinner snack, try it for breakfast! Seems like a lot about Miso, but it is just one of those things! Congratulations on the blog Katie! We moved last year and found the most fabulous little Japanese restaurant in town. I never cooked Japanese food before but now I am trying. This sounds delicious! Katie, I am so glad you stuck it out with the ramen. Sometimes when I make it for the kids at the school (especially the older ones), I say to myself “never again!” because it can be a bit hairy getting everyone served before people start asking for seconds. The key is to be super organized. Also thank you for taking a chance on a type of food out of your comfort zone. One of the main reasons I wrote the book (besides that I was compelled to from life and other) was that I wanted people to understand how truly simple and accessible Japanese farm food can be. And perhaps as a very major side point, how non-mysterious the Japanese as a people are. We really are all the same with some minor shifts in focus or cultural ways. Thanks again for your perceptive review. I am now back in Japan trying to catch up on various so cannot madly post reviews to Facebook or send out multiple tweets of the same ilk. Soon though. Nancy. The ramen looks beautiful and I was glad to see a chicken version. I’ll look to get this cookbook when I return home from Japan.